In a small bowl, whisk together yeast, sugar and warm water. Let sit about 10 minutes until foamy. Heat cup of water, molasses, vinegar, butter and chocolate in a small saucepan until the butter and chocolate are melted. Set aside. Whisk together whole wheat, rye and all-purpose flours in a separate large bowl. Set aside. In the bowl of a stand mixer fitted with paddle attachment, combine 2 cups flours, bran, caraway seeds, fennel seeds, salt, espresso and shallots (or red onion). Mixing on low speed, add yeast and chocolate mixtures. Mix at medium speed until smooth, about 3 minutes. At low speed, add 1/2 cup remaining flours at a time, using a spatula to scrape excess flour from the sides of the bowl. Add just enough flour until the dough comes away from the sides of the bowl. Switch to dough hook and knead about 5-8 minutes on medium speed — adding 1 tsp all-purpose flour at a time if needed for dough to pull away from the sides of the bowl — until smooth and elastic (or knead by hand on floured countertop for about 10 minutes until smooth and elastic). Shape dough into a ball and place in a lightly greased bowl, turning once to coat. Cover with plastic wrap and let rise until doubled, about 1-2 hours. Turn out risen dough onto a lightly floured surface. Shape into round or sandwich loaf and place either on a parchment paper-lined baking sheet (for round) or in a lightly greased loaf pan (for sandwich loaf). Cover lightly and let rise until doubled, about 45 minutes to 1 hour. Slash an X in the top of the round before baking (this is not needed for the sandwich loaf). Preheat oven to 350°F. Bake bread until deeply browned and 200-210°F when an instant-read thermometer is inserted in the bottom center, about 45 to 50 minutes. Allow bread to cool completely on cooling rack before slicing. I’ve been trying to build myself a bucket list for years. Sometimes, along with “write a book” and “go to Greece,” I think “write bucket list” should go on my bucket list! One thing that is on my rather paltry bucket list is “bake pumpernickel bread.” Pumpernickel – light or dark – is one of my absolute favorite types of bread, and I knew that making it at home would be a real treat. Of course, this Russian Black Bread isn’t quite pumpernickel. The bread does taste strikingly similar to my beloved pumpernickel, and the ingredients — rye flour, molasses, cocoa powder — seem to fit the bill. But it just wasn’t quite the same. So I’m on the fence as to whether or not I’ve actually “baked pumpernickel bread.” Regardless, it was still the treat I’d hoped it would be. I can’t say I’m disappointed in my slightly off-track endeavor — this bread renders a flavor so rich and dense that it is, dare I say it, better than pumpernickel! 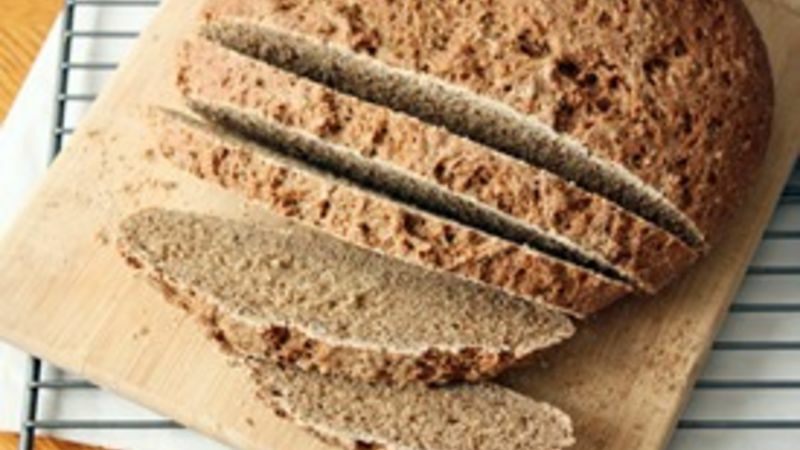 I only say this because I’ve eaten pumpernickel so often that this bread offers a new dynamic of flavors – a refreshing change. I know the list of ingredients is rather intimidating, but I don’t recommend cutting corners with this bread – each ingredient significantly serves a purpose in creating that unique black bread flavor. The result is delicious on its own, with butter or with mayo and fresh, sliced tomatoes as a simple, late summer sandwich. It’s bread worthy of putting on a bucket list and crossing off as soon as possible.